Most ticks, approximately the size of a pinhead prior to feeding, are not spotted until they become engorged with your cat’s blood. Regardless of how long the tick has been feeding on your pet, you should remove it immediately with tweezers while wearing gloves. Any contact with the tick’s blood can transmit infection. Ask your veterinarian for proper tick removal methods because simply pulling the tick off of your animal can leave the mouth, head, or other body parts attached to your cat. For veterinary professionals, more detailed information on ticks can be found at https://www.capcvet.org/guidelines/ticks/. If you find a tick on your cat, put on gloves and remove the tick with tweezers. Just pulling off the tick can leave body parts attached to your cat. Ask your veterinarian about proper tick removal and tick control. Illnesses transmitted by ticks can case fever, anemia, loss of appetite, lethargy and depression. If you live in an area with ticks, keeping your cat indoors is the best way of preventing ticks. Ticks can cause anemia as well as carrying many diseases. 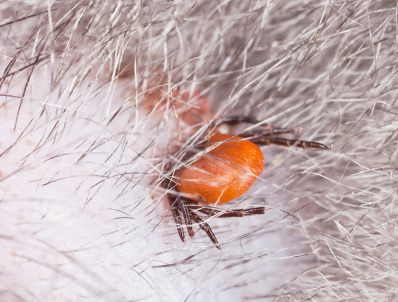 Your veterinarian may prescribe medication that helps prevent ticks from attaching to your pet and kills any that do, and will show you the safe way to remove ticks without breaking off the head and leaving some of the tick attached to your pet.